In between tasks today I found myself a little unmotivated, so decided to take a fifteen minute break to rest my brain a little. Usually I’d turn to BBC News, HackerNews or Reddit, but this time I decided to do something a little different: for whatever crazy reason, I decided to see if I could make a playable game in just fifteen minutes. 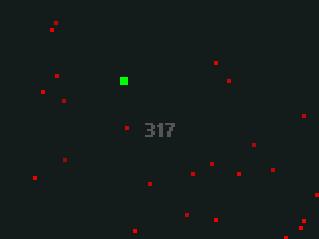 My idea was purposefully simple: a basic mouse avoider game. That way I wouldn’t need to worry about input handling (beyond setting player.x/y to mouse.x/y every frame), or complex collision detection (simple overlaps would do). The first goal was to create the absolute minimum required: a player square that follows the mouse. That was dead easy, so I was onto creating the enemy squares next. The last game like thing to add which I nearly forgot was a score. I considered increasing the score for every enemy created, but instead settled for a simple score++ every frame the player is alive. With the fifteen minutes up, I did a final build and committed the result to Github. After this I slapped in a basic title screen with a quick to start – I’ve added this to the template I’ll use from now on. This entry was posted in 15MinGameDev, game development by jayrobin. Bookmark the permalink.